When we booked our special holiday lunch at two star Vila Joya, it was listed as No 42 in the World's Best 50 Restaurants. That seemed very promising, but things got even better shortly before our departure when the latest rankings were issued. Vila Joya had moved up the table to No 37. Now the anticipation levels were even higher. We arrived a little early, about 30 minutes in fact, as we didn't want to be late. (Typical Irish eh?) After gaining access through the gated entrance, we found ourselves in the peaceful grounds of the Vila Joya hotel. We were taken through to the bar area, which opens out onto the sunlit terrace. With time to spare, we ordered some cocktails, a Negroni for me and a whiskey sour for him. Preparation was well underway for the lunchtime service with the waiting staff doing many different things all at once. The serving staff were attired in snowy white uniforms, including what I could only describe as Hammer Pants. A little googling later revealed that this was probably a variation of Portuguese traditional dress and not a tribute to the master of "U Can't Touch This". In due course the maître d' started to bring the parties outside to their tables on the terrace. The view from here is incredibly beautiful with landscaped shaded gardens falling away from the terrace, down to a picturesque little beach and the stunning green blue sea beyond. White canvas parasols shade each table, protecting diners from the sun. If it gets a little too breezy on the terrace, blankets are provided to keep you snug. I'd say that it would be equally gorgeous here at nighttime, with burners illuminating the terrace, and the sound of sea below. Surprise starter Number 1 featured a crisp roll with avocado puree, a sour cream "oyster" with caviar, light crisp discs with small octopus tentacle and caipirinha spheres. Careful removal of the crisp roll from the pincer-like holder was required, and the smooth creamy filling tasted like the darkest, greenest essence of avocado. Lifting the spoon holding the sour cream sphere and letting it slip down really did reproduce the feeling of eating an oyster, followed by the salty pops of caviar. 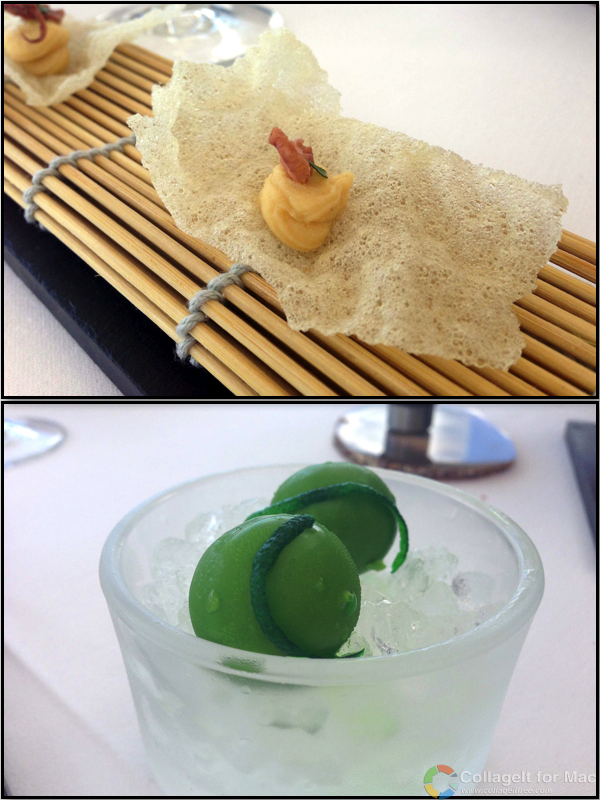 The delicate crisps reminded me of extremely gourmet prawn crackers, and the caipirinha bombs exploded open in your mouth, releasing a not-too-sweet lime experience. 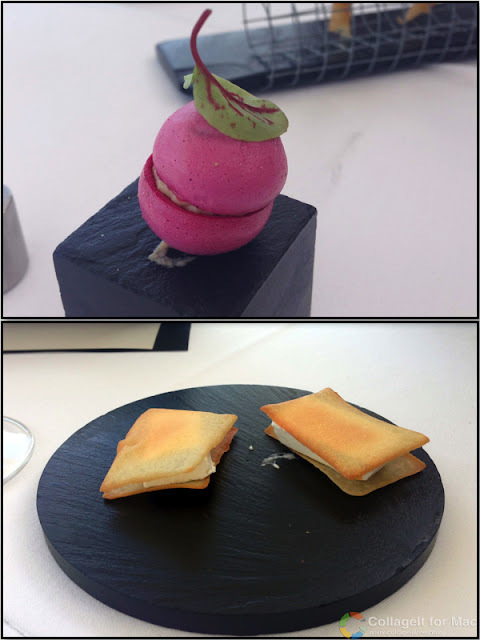 Surprise starter Number 2 arrived with another pincer contraption holding a cone of steak tartare, a beetroot macaron atop a little slate cube, some parmesan sandwiches and little rolls of crispy fried pata negra. The steak tartare was meatily chewy all in a delicate cone, but we were both blown away by the sweet, smoky, saltiness of the beetroot macaron which was sandwiched with an eel filling. I would have happily paid €110 for a tray of those delicious little flavourbombs. Moving on, the parmesan crisp sandwiches with a smooth cheese filling were calming after the rich flavours of the first two components, with the parmesan flavour still showing through. Little crispy cigarillo shapes of pata negra finished off a wonderful starter of salty, meaty flavours. Surprise starter Number 3 was all about seafood. Once again, delicate crisps were in evidence, flavoured with gentle spice and topped with little brown shrimp. Sweet razor clams were served in their shells contrasting with sharp, tangy yuzu citrus and decorated with beautiful edible flowers. 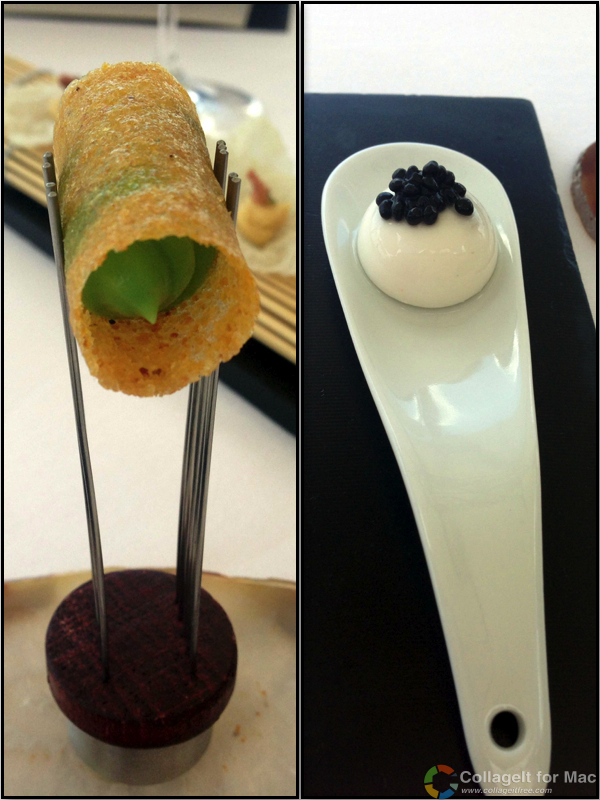 The final dish featured salmon, rolled in a little pancake, accompanied by cucumber. After this extravaganza of tasting delights, it was time to start the meal proper. 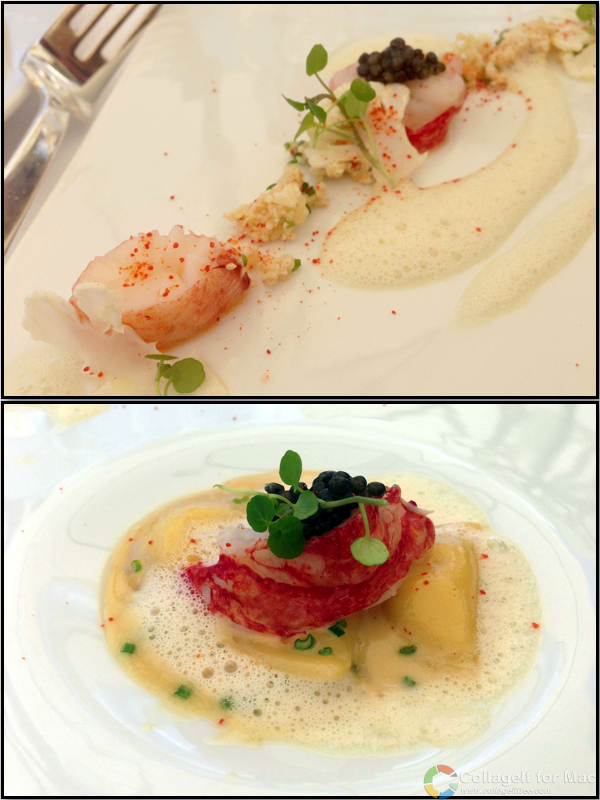 First up was a stunningly beautiful dish of Atlantic lobster, cauliflower and caviar. Ravioli filled with celery and served in intense bisque was truly sublime, even for a celery-hater such as myself. All the rawness and bitterness of celery had been removed, leaving a smooth, creamy flavour that was the best part of celery. Monkfish with capers and artichokes featured a perfectly cooked piece of this magnificent fish, topped with peeled, cooked artichokes, tiny gnocchi, deep fried fresh capers and red pepper. A rich meaty jus provided colour and taste contrast, while the artichokes allowed the sweet meatiness of the monkfish to shine through. Our meat course featured a duo of beef (steak and cheek) with spinach and pepperpolenta. 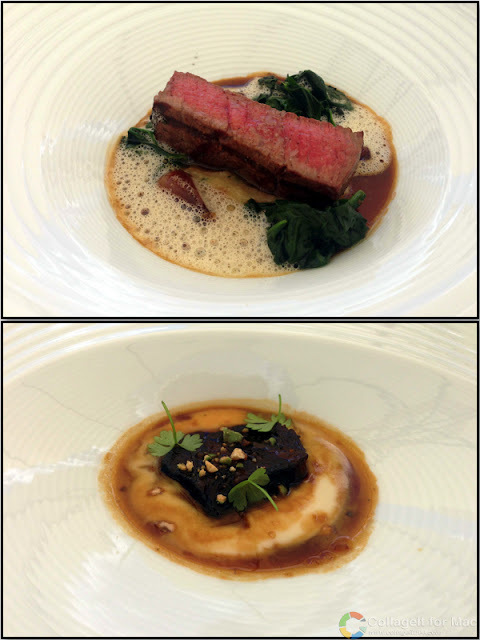 Beautifully pink and seared beef, wilted spinach and a perfectly small amount of peppered polenta came in one dish, while another plate held a carmelised, glutinous piece of beef cheek atop the classic partner of creamed celeriac. Main courses done, it was time to wait for the dessert. But of course, there was another surprise course. A reconstructed coconut with coconut ice-cream coated in a dark chocolate shell was visually clever and tasted well, but the accompanying banana ice-cream, pineapple & passionfruit were somewhat lacklustre. Finally dessert proper arrived. Listed as apple, hazelnut and honey, it was both light and crisp, yet smooth and creamy. A final surprise came with in the shape of a little dessert bowl of coffee and caramel flavours, accompanied by a glass of viscous, sweet Moscatel de Setúbal 1998 with citrus and nutty flavours. An utterly divine glass on which to finish a meal. I had planned on ordering coffee so that I could continue the gluttony with petit fours. But before I could order, a slate of bonbons was delivered to the table. However, at this stage I had consumed several glasses of fine wine, in the afternoon sunshine, so I decided coffee could be a judicious move anyway. Overall, this was an educational dining experience. The real oohs and aahs had come early in the meal as we worked our way through the three surprise starters but overall, we had absolutely enjoyed every dish. My single negative comment about our visit came with the arrival of our bill, where the unexceptional cocktails were listed as €19.50 each. Even at a two star restaurant, that is gouging. In comparison, the very next day we dined at the very fancy 5 star Bela Vista hotel where pre-dinner cocktails cost €9. But food, while extremely important, isn't everything at a Michelin restaurant. Throughout our leisurely lunch, we observed that everything at Vila Joya was precise and correct, from the waiter etiquette right through to the food presentation. 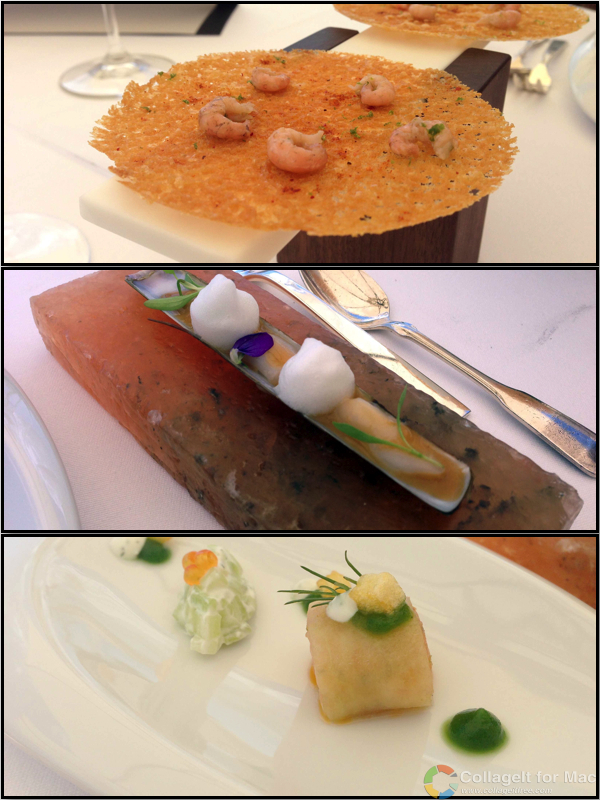 Vila Joya is a great illustration of what is required to be a true fine dining establishment. And it's nice to see that even with this high level of service, the restaurant is still relaxed enough to allow pet dogs on the terrace during service. Ultimately, the very best way to judge a restaurant is your likeliness to return and long lengthy lunches on sunlit terraces are hard to forget. Memories are made of this.